Most smartphones are too fragile for job sites. They break when they’re dropped, or crap out when submerged in water. The Cat S60 is different. It’s designed to take a ton of punishment and continue to operate. It works when it’s completely underwater, can be used normally when the screen is wet, and most importantly for our purposes, it’s the first phone to include a FLIR thermal imaging camera. Yup, Predator vision. 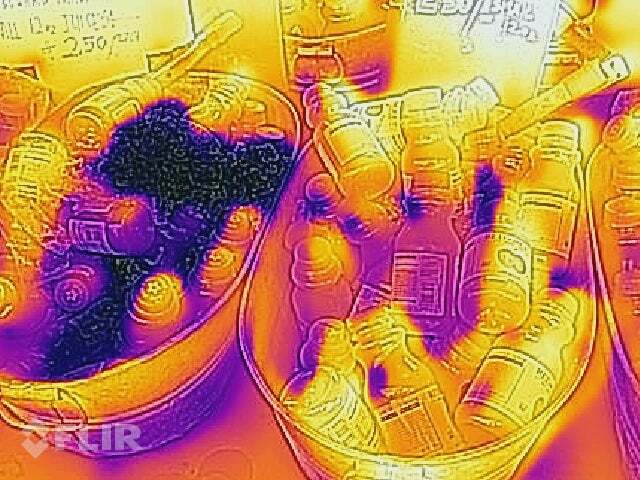 There are plenty of other, more useful, ways to use the FLIR thermal camera, and there’s even a small dongle for your phone (£200) if you want to using one yourself. For the person that regularly needs heat vision, though, it’s better to have the technology built right into the phone. People working on job sites don’t want to worry about losing a small dongle or breaking it. The Cat S60 jams the dongle into a device that’s actually kind of attractive — for a rugged phone at least. This isn’t the Galaxy S7, and it’s much chunkier than the similarly designed Galaxy S7 Active, but there’s some charm in there too. You just kind of want to like this guy. 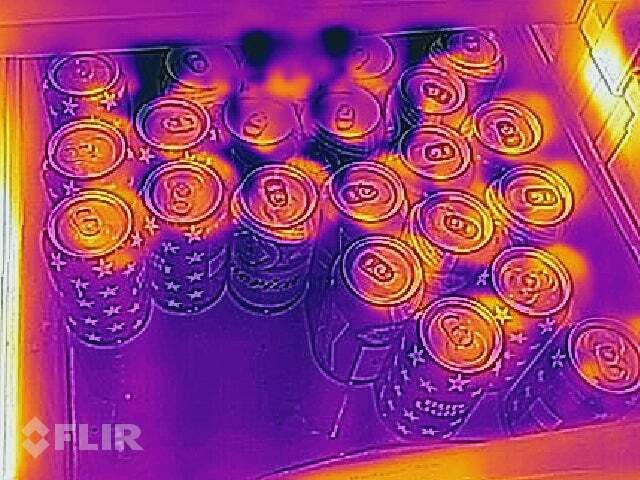 The reason the Cat S60 is so helpful compared to other thermal imaging options is because it shows temperatures in real time. 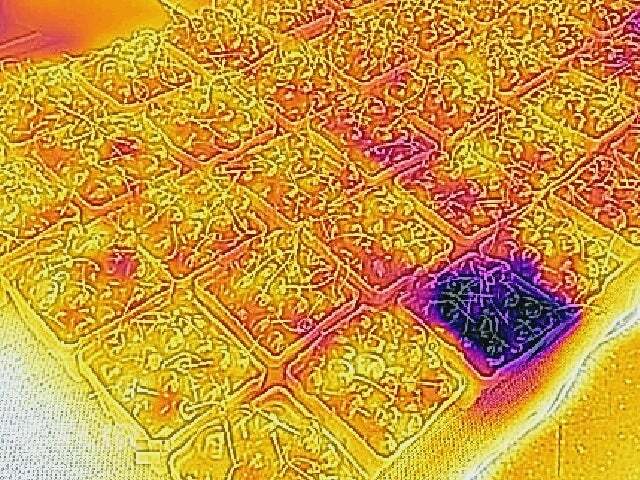 The phone can even take a photo or video of the thermal camera, letting you retroactively examine a specific area. 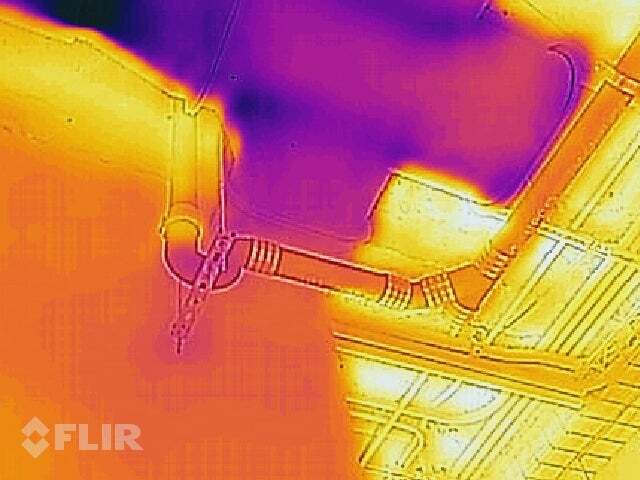 The FLIR app also lets you place crosshairs on the screen to measure the specific temperature of different areas in the same photo or video. 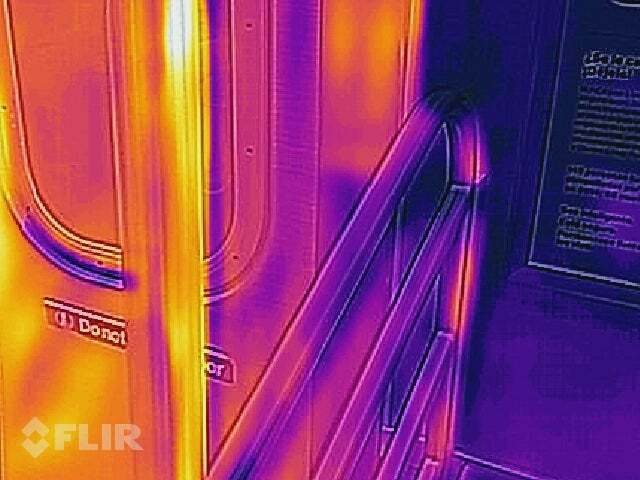 The phone actually has two cameras on the back that allow it to show temperatures in real time. 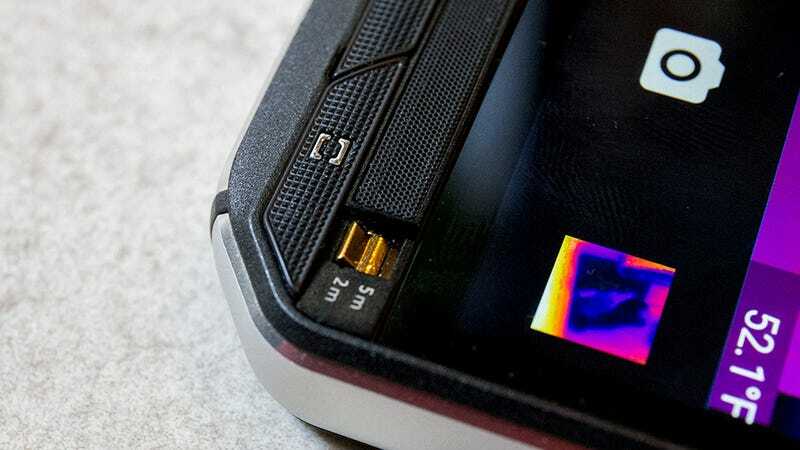 The FLIR Lepton thermal camera is combined with the regular camera to provide a live preview. 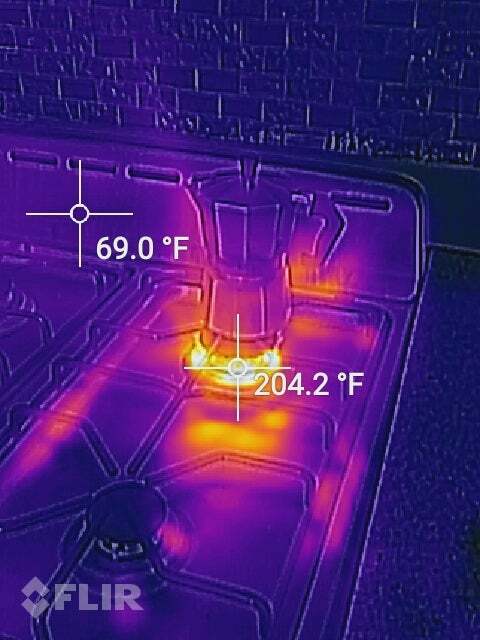 This is a huge benefit because other thermal imaging cameras, which can actually be quite expensive, display blurry images that are often hard to interpret. The Cat S60 cameras are more intuitive and generally more user friendly. In addition to its Predator vision, the Cat S60 can also take a beating. The company claims it’s drop-proof up to two metres and a fall while I was bicycling seems to support that. What would have shattered an iPhone left the Cat S60 with nothing more than a nick in the case. The 2m to 5m switch for waterproofing. The S60 is also one of the rare camera phones that can take photos underwater. Much was made of the water-resistance of Samsung’s new series of S7 phones, but those could, at best, only survive underwater. The S60 actually functions in deep water (OK, only up to 5 meteres). The phone has two switches that you can flip on the front of the phone to toggle between 2 metres and 5 metres of waterproofing — with the latter closes off ports and speakers. When you compare the Cat S60 to the drop-friendly Samsung Galaxy S7 Active — which couldn’t survive a Consumer Reports test at five feet under water, it’s not even a contest. The Cat S60 and Active might be neck and neck for ruggedness, but the S60's waterproof chassis wins out. There are a lot of other great things packed into this chunky little phone. SIM management can be a nightmare in most phones, and is usually next to impossible in waterproof ones. It’s the first feature sacrificed in order to make a perfect waterproof seal and protect the internals. The S60 bypasses the problem by including a quick release door built into the back. 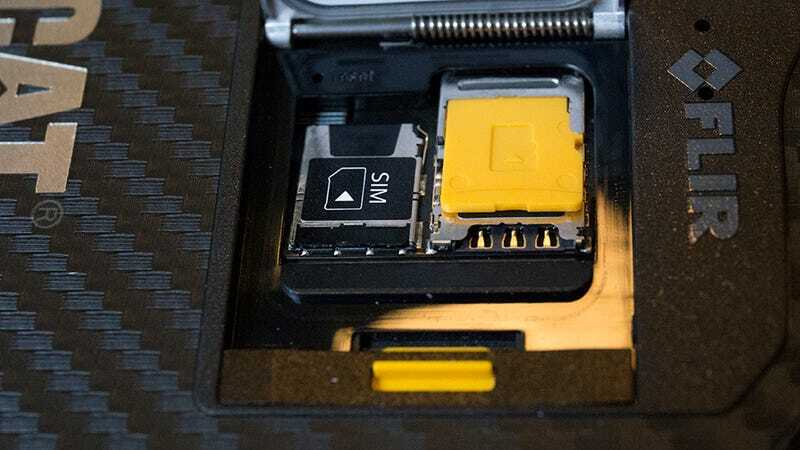 It gives you easy access to the SIM card and microSD slot when you’re not diving into the dreck. The phone also comes with 32GB of storage and 3GB of RAM, which should make it powerful enough to last for the next two years. The phone does well in the OS department too. The Cat S60 ships with Android 6.0.1 Marshmallow and only a few bloatware apps. There’s a bizarre “App Toolbox”, for instance, with suggested apps for “rugged” hobbies like fishing and construction. Unfortunately, some of the categories are entirely blank. The few categories that do have suggested apps are mostly filled with tat. One surprisingly cool app bloating the phone is called FM Radio, which is exactly what it sounds like. The reception on the FM Radio app worked exceptionally well, and it was pretty easy to figure out. If you’ve been missing out on your local stations since most manufacturers cut the FM radio antennas years ago, then the S60 is there for you. 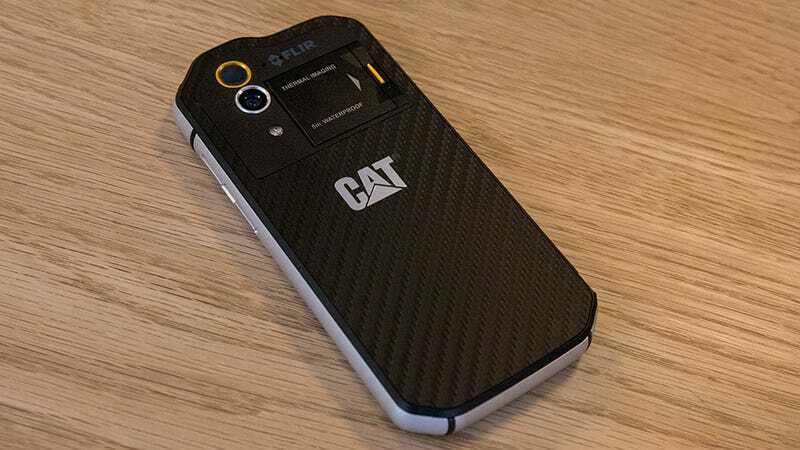 The Cat S60 is a goofy Swiss army knife in a field of phones content to just be sharp little switch blades. It’s packed with a lot of cool gadgets, but not necessarily ones most people actually need. 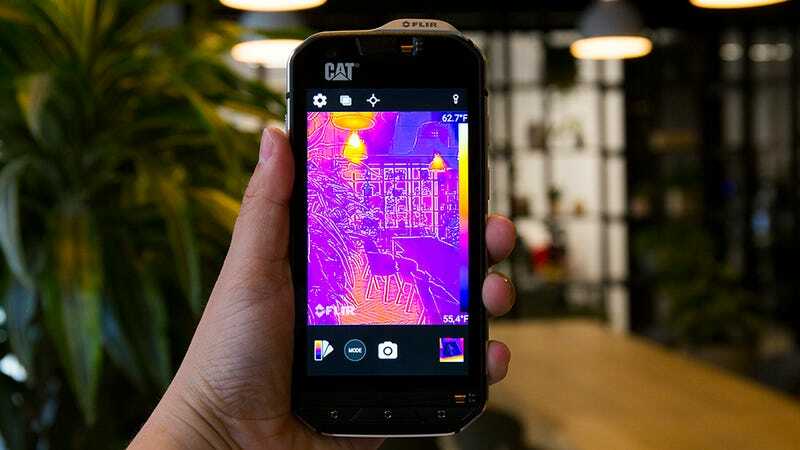 I would happily recommend this phone to anyone who uses a thermal camera on a daily basis, but who would base their buying decision on an FM radio or the ability to take photos in a swimming pool? The CAT S60 (RRP £529) makes up for its lack of sleekness with ruggedness (and waterproofness) and gadgets out the yang. It solves all the problems that plague every other fragile phone out there. 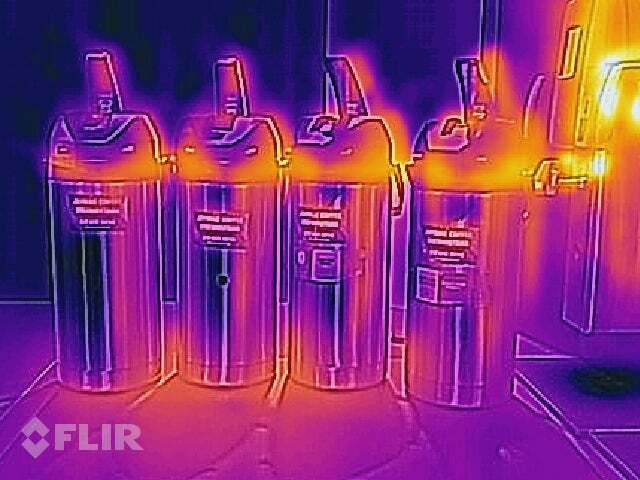 The Cat S60 is ridiculously capable in water, can take a fall like no other phone, and can get a couple of other cool things done with its FLIR thermal camera. If you’re an average smartphone user, you don’t need the CAT S60, but if you’re someone who’s constantly checking gauges and working on homes, I can’t imagine a better phone for the job. The most waterproof phone available.